I’ve known Kevin Kruse for many years. He and I met at a meeting of the Society for Pharmaceutical and Biotechnology Trainers (now L-TEN) over a decade ago. Since that first meeting, we’ve co-presented on the topic of evidence-based training, worked together when he was a CEO of one of his many companies, collaborated on parts of his ground-breaking website/blog eLearning Guru and frequently meet up at speaking engagements. Kevin is great, always friendly, focused and willing to share his knowledge and ideas. Since that time, Kevin was instrumental in the name change from SPBT to L-TEN (an organization which he headed for a number of years), he has become a New York Times Best Selling Author of the book We: How to Increase Performance and Profits through Full Engagement and has been speaking around the world on management topics to packed houses. He and I found some time to catch up the other day and it was a great exchange. Here are some of the highlights of the conversation. But before you start reading, a little spoiler alert….the best part of the conversation is at the end when he gives some GREAT and thoughtful advice to students. In fact, it’s great advice for anyone! Check it out. Kapp: You have a great new book out, can you tell me a little about the book and why you wrote it? Kruse: Sure. This book is a little different than previous books I’ve written. It’s really a passion project. I’ve long been fascinated by time and productivity both from a philosophical standpoint—how to live in the moment and make the most of our lives—but also from a practical standpoint. Back when I was young and dumb, I had a modest amount of business success but was unhappy, unhealthy and a stressed out jerk to those around me. Later I learned habits that enabled me to literally increase my productivity ten-fold, while also dramatically reducing my stress. 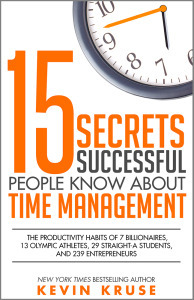 NOTE: You can get Kevin’s book here and I suggest that you do, great ideas on time management–something we all need. Kapp: Time management is a critical topic in today’s world and much studied, what new insights does your book add to the field? Kruse: [Laughs] You are being polite. “Much studied” is a nice way to say, “Why the heck do we need another book on time management! Well, it turns out everything we’ve been taught in those time management courses is wrong. What worked 50 and 100 years ago just doesn’t work in this fast paced, global, digital world we live in today. If it did work, we wouldn’t all be running around “crazy busy” and feeling so overworked and overwhelmed. 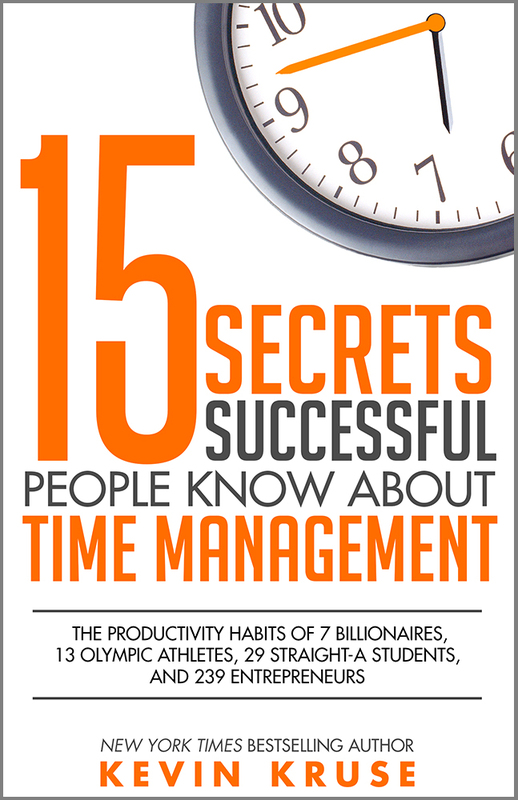 This is the only book on productivity and time management that is based on original survey research—I surveyed over 4,000 working professionals looking at links between their habits and levels of productivity and stress—and also the only book based on over 200 qualitative interviews with billionaires, entrepreneurs, Olympians and even straight-A students. Kapp: When you did the research for you book, what was the biggest surprise to you? Any “aha” moments? First, all these high achievers had what I call the “1440 Mindset”. They truly felt in their bones that time is our most valuable asset, and we only have 1,440 minutes in each day. Time is way more valuable than money. We can lose our money and make it back again. We can even lose our health and regain it. But time—once those minutes tick away we are never going to get them back. And without time, we can’t enjoy our health, our money, our family. You truly need to master your minutes to master your life. The other big aha was how many ultra-productive people give credit for their success to their morning routines. I wasn’t looking for that at all. So many said that their first 30 to 60 minutes of the day determine their entire productivity level for the next 16 hours. They don’t all have the same morning routine, but there is a lot in common. Overall, ultra-productive people wake up early. At least by 6 AM and many earlier. They pound down some water and breakfast—very often a green smoothie or protein shake. They know that overnight we dehydrate and our bodies wake up low on glucose, which is the fuel that runs the brain. So they don’t skip breakfast. They do something physical, not necessarily a big workout, more like 20 minutes of yoga, or walking. They do something mental or spiritual. Some described their meditation routines, others pray, others review their goals and journal. Kapp:You have so many good tips in the book, what do you think is the one tip that leads to the most productivity gains? Kruse: Ultra-productive people don’t use to-do lists. To-do lists are old technology that doesn’t work. One study last year showed that 41% of all items on to-do lists are never done at all! To-do lists are where important but non-urgent things go to die. Instead of to-do lists, ultra-productive people live from their calendar. Usually in 15 minute chunks. And everything gets scheduled, not just meetings and phone calls. 15 minutes to process social media, on the calendar. 30 minutes to process email, scheduled on the calendar. A time-block to return phone calls at the end of the day, 30-minutes on the calendar. Workouts, date nights, weekly grocery shopping…everything is scheduled. Kapp:What advice do you have for students coming from an instructional technology program and entering the field? Kruse:First, don’t worry about the specific job or title or salary, worry about the company and who your boss will be. It’s better to be in the worst seat on a rocketship than the best seat in a boring old slow no-growth bunker. Second, you can land your dream job in your dream company if you start working on it one year before you need the job. One year early, you should write a book, launch a company and get a massive number of connections on LinkedIn (sorry Snapchat doesn’t help). I’m not joking. While everyone is circulating their resume, you’ll be circulating your book. Writing and publishing an OK book has never been easier. Pick a topic semi-relevant to your field. It can be about some aspect of instructional design. It can be about your capstone project. It can be how to survive an instructional technology program, whatever. It doesn’t need to be amazing or long. Plan to write 20,000 words and self-publish on Amazon. If you can write 500 words a day (come on, you can write 500 words a day, right?) you can be done with your first draft in 40 days. What’s that? You can’t write that much? Fine, interview the 10 biggest thinkers in your topic area and you have 10,000 words already. By the way, you can get access to anybody as a student. Everybody LOVES helping students. Want to go work for giant XYZ company in a year? Go interview the CEO for your book. Invite people to contribute their thoughts and ideas. Do a small survey and write up the results. Being an author will give you an incredible edge through your whole life. At the same time you’re writing your book, start your first company. It’s never been easier or cheaper than to be an entrepreneur. And you’re going to fail. Well, statistically speaking you will. After all venture capitalists are the smarted humans on the planet and for every 10 companies they think are a great idea only one or two work out. But that’s not the point. You start some mobile app company, or SaaS company, or whatever. Something cool. And even if you fail—if you’re going to fail, it’s better to fail quickly by the way—you’re going to have amazing experiences to share. Which answer do you want give when the interviewer asks you, “So, how did you spend your summer?” Do you want to say, “I worked at McDonalds and learned the value of teamwork.” Yeah, right. Or, “Oh, I started a tech company and we launched a mobile app that help X do Y. Unfortunately, we crashed and burned. Even though I worked up a strategic plan, was willing to work 80 hours a week, pitched a dozen investors, managed software development out of India, developed our customer service protocols…just couldn’t get traction.” Yeah, what a failure. You’ll be a rockstar. And let’s not forget LinkedIn. Even if people say they want a resume, you are your LinkedIn profile. Everybody—all recruiters—will sniff you out on LinkedIn. Soooo many college grads tell me, “Uh, my generation doesn’t really use LinkedIn.” Or, “I don’t have any work experience so don’t need to be on it.” Dumb dumb and dumb. You are your LinkedIn profile so fill it out well, get some recommendations and the biggest one…social proof is all about how many connections you have. It might not be fair, but if you have less than 100 connections on LinkedIn people think “newbie” or “loser”. If you have 500+ you’re a total rockstar. It will be hard at first, but you can connect with friends, family members, professors, your parents work friends. Heck, get 100 fellow students to agree to all follow each other, voila! Then participate in a few of the Groups and reach out to all the people in the group. People will connect even if they don’t know you personally. As long as you’ve had some kind of online interaction, they’ll connect. Kapp: Kevin, great advice and thanks for the making the time [LOL] to speak with me. If anyone wants more information, check out Kevin’s web site and definitely grab this book. It will save you time and make you more productive!